A shogun (将軍, shōgun, [ɕoːɡu͍ɴ] ( listen)) wis the militar dictator o Japan during the period frae 1185 tae 1868 (wi exceptions). 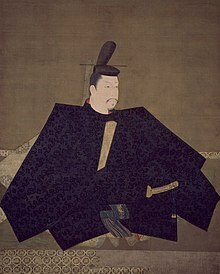 In maist o this period, the shoguns war the de facto rulers o the kintra, awtho nominally thay war appyntit bi the Emperor as a ceremonial formality. The Shogun held awmaist absolute pouer ower territories throu militar means. Nivertheless, an unuisual situation occurred in the Kamakura period (1199–1333) upon the daith o the first shogun, whaurbi the Hōjō clan's hereditary teetles o shikken (1199-1256) an tokusō (1256–1333) monopolised the shogunate as dictatorial poseetions, collectively kent as the Regent Rule (執権政治). The shogun during this 134-year period met the same fate as the Emperor an wis reduced tae a figurheid till a coup in 1333, when the Shogun wis restored tae pouer in the name o the Emperor.